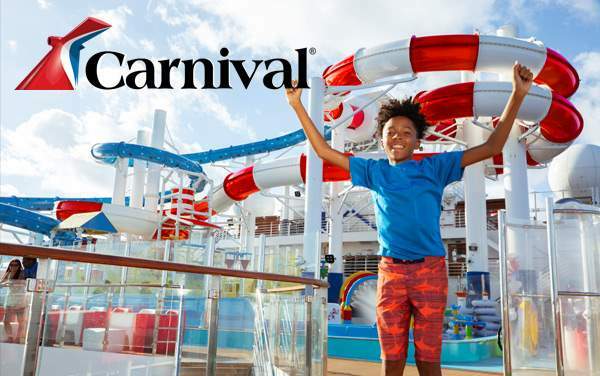 Carnival Cruise Lines offers the ultimate in family fun, but that doesn’t mean you’ll be lacking in fitness and spa options on your next cruise vacation. Find your inner peace at the Serenity Adult Retreat, or enjoy some serious spa treatments at the Cloud 9 Spa. There’s even a place for Men’s Services, so everyone can enjoy the treatments or fitness options they need onboard their voyage. Sometimes the most important thing about a vacation is the tranquility of a little time that’s focused on one thing: you. Serenity Adult Retreat is the spot for serenity, a place where those who need a “getaway within the getaway” can enjoy full bar service, sun-splashed relaxation and some blissful whirlpools. Mellow music brings the ultimate vibe to fruition. This area is known as an adults-only area, meaning it is only available to those 21 and older. This two-deck spa really lives up to its name, meaning you’ll feel as if you’re floating above the clouds when you head over to the Cloud 9 Spa. 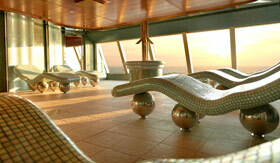 There are exclusive spa staterooms, incredibly advanced and innovative facilities, and serene, delightful treatments. The setting will be nirvana, featuring delicious aromas, oils, hot stones and defoliants, among many other marvelous features such as: Acupuncture Massages, Body Wraps / Slimming Treatments, Thalassotherapy Pool, Facial Treatments, Tooth Whitening, Men’s Services, Special Spa Packages, Steam Rooms, Water Therapies, Thermal Suites. Note: some treatments are only available on select ships, so be sure to speak with our consultant about your ship beforehand. 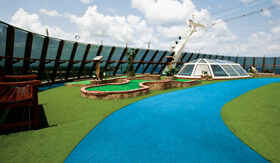 You may not be able to walk on water, but you can surely run on the Carnival jogging track. Tie up your tennis shoes, stretch out and let your worries slip away as you run on an outdoor jogging track along the ocean view. 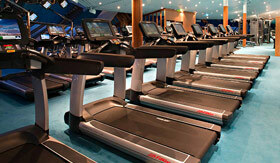 It’s open at all times, and is always there to get a great workout, or just to clear your head. Don’t like the high-paced exercise option? Head out for a serene stroll under the stars later at night. Don’t lose that vacation bod just because you’re on vacation! Head over to Spa Carnival’s decked out fitness center for a nice jog, some weight training or cardio classes to get your heart rate going. There’s nothing quite so rewarding after a day of relaxation, delicious cuisine and family fun like a fitness session that brings it all together. There’s even yoga, Pilates and a few other fee-based classes that can bring the peace back into your mind and heart. 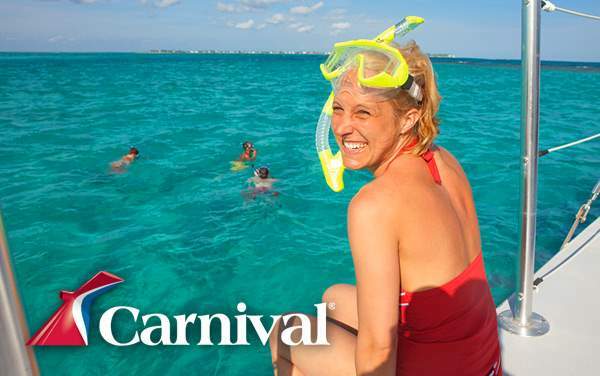 When you choose a Carnival Cruise, you won’t be limited to family fun and incredible cuisine—you can maintain your beautiful skin tone, shimmering hair and overall self-beauty when you visit the Hair and Beauty Salon. This European-inspired salon will keep you looking your best with trained professionals ready to make you feel like a celebrity and pamper you like never before. 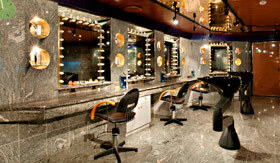 Offerings include hair styling, new color, manicures, pedicures and more. Don’t worry about having to head into a woman-focused beauty salon if you’re a man who appreciates a well-groomed look. 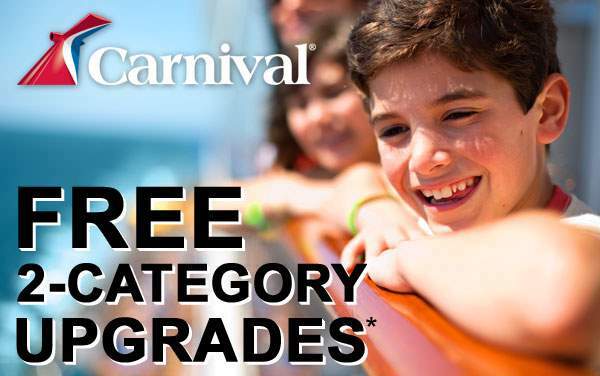 You can come down to Carnival Cruise Lines’ Men’s Services for manicures, pedicures, shaves and a cut (or even a facial if you so please). Relaxation can come in the form of a massage, or let the steam room open your pores and lift your spirits. Call it what you like, but Men’s Services will keep you looking your best. 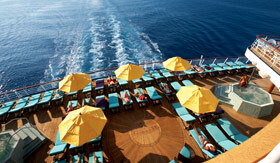 Peace is just a stroll to the yoga and Pilates classes away when you’re cruising with Carnival Cruise Lines. There’s a wide range of activity classes available to you, whether you’re looking for meditative stretching, high-level yoga or something in between. You can find out the offerings and times in the Fun Times, and don’t worry—it’ll be gentle on your wallet as well.